“Wait!” I hear you saying. What happened to the week of highball drinks? I confess, a punch is not exactly a high ball, but we just so happened to serve it in the style of a highball, so I must ask you to indulge me. My friend James and I had scheduled a beach party, or what passes for one in Washington, and we wanted to make sure the party popped, and the only way to do that was with a seasonally appropriate punch. I knew I wanted to use an oleo saccharum as the base, and I knew that I wanted to incorporate rum and wine, but I did not have an exact recipe. I googled around, and I considered this Philadelphia Fish House Punch from Jeffrey Morgenthaler, and this Chatham Artillery Punch from Doug, but I ended up just doing my own thing. I did take some advice from Putney Farm regarding the ratio of spirits to wine, however, and chose to use three bottles of rum and three bottles of wine, but with a small twist. I wanted to infuse mangoes into the punch, so I did not want to use a sparkling wine, as the carbonation would all seep out over night. On the other hand, I wanted a touch of carbonation in the final product. James and I decided to compromise, using two bottles of Pinot Grigio for the infusion, and reserving a bottle of Prosecco to be used for topping off the punch at serving time. This worked very well, except we ran out of Prosecco about half way through the punch. I conclude that we should have had two bottles of Prosecco. Alas. Make oleo saccharum by saturating and muddling the orange peels with the sugar. Allow it to sit for two hours, stirring and muddling occasionally. 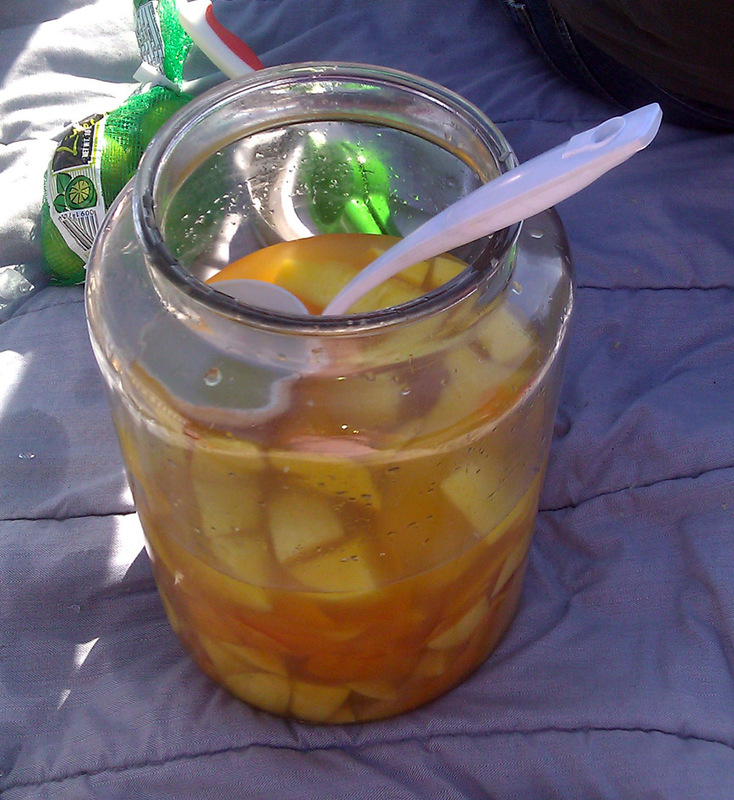 Add the rum and the Pinot Grigio to the oleo saccharum, along with the mango chunks. Cover and allow to sit overnight. At serving time, juice the limes into the punch. Fill cups with ice and add 1-2 oz of Prosecco, then fill with punch. The best thing about punch is that it allows you to fill the cups of all your guests without sacrificing your ability to interact with them socially. Normally I am very adamant about avoiding ambiguity when “topping” a drink with something sparkling, but it was a beach day, and it wasn’t worth stressing over. Ideally, you want just enough to add a bit of effervescence. The punch weighs more than the Prosecco, so you should pour it into the cup before the punch, in order to facilitate good mixing. The oleo saccharum lends a fragrant, unctuous richness to the entire drink, similar to the oils in a cup of well-made French pressed coffee. Usually the fruit that is used for infusing completely gives up the ghost, and there is no reason to eat it, but in this case, due to the short infusing time, and possibly the density of the mango, we all found the pieces of punch-soaked fruit to be delicious. When you serve the punch, consider ladling one or two pieces of the fruit into each cup. Even the orange peels didn’t taste bad, but they weren’t great, either. Categories: original creations | Tags: aged rum, alcohol, bacardi, booze, cocktail, cocktails, drinking, drinks, lime, mango, mixed drinks, mixology, oleo saccharum, orange peel, parties, party, pinot grigio, prosecco, punch, rum, sugar, wine | Permalink. Sounds very good, and thanks for the mention…like the tip on putting the ligher sparking wine in first. Bravo! Cheers to your exquisite rum punch.